How would you like to pay $85 for a $100 bill? Well, no one we know is offering such a deal; however you can buy a $100 Apple App Store and iTunes gift card from PayPal for $85. To take advantage of the offer, which appears on eBay, buyers need to have a PayPal account. Up to four hours after the purchase is made, the buyer will receive an email containing the code required to make a purchase with the card. 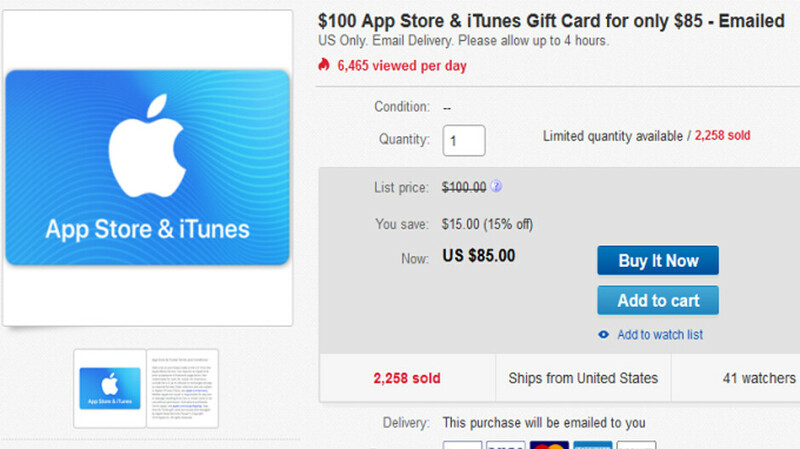 By paying $85 for a $100 App Store and iTunes gift card, you are grabbing a 15% discount from the face value of each card. After ringing up 2,258 cards already, PayPal says that it has a limited quantity of these available. While we don't know how many cards are left to purchase, you might not want to procrastinate. After all, it isn't every day that you're offered $100 worth of merchandise for $85. And there seems to be no restrictions on the number of cards you can buy. The card can be used in the U.S. App Store and iTunes Store to pay for apps, third party app subscriptions, games, streaming content from iTunes, and iBooks. It can also be used to pay for an Apple Music subscription. With the holiday shopping season kicking off at the end of this week, now might be the perfect time to snag some of these gift cards and use them to pick up some holiday gifts for your iOS toting friends.